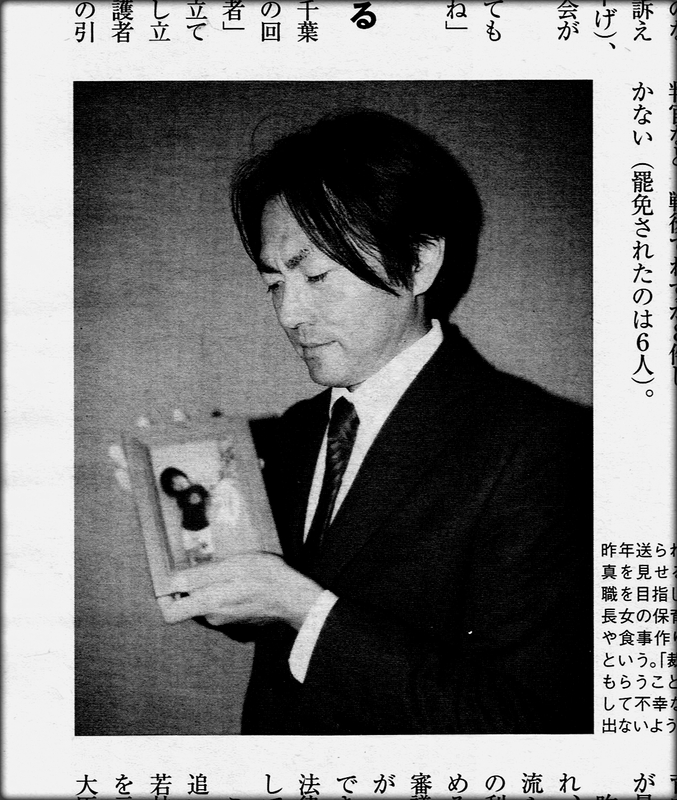 Watanabe-san in 2012 with a photograph of his daughter. Four years later, he regained the right of custody. I read, or at least I tried to read, a story on the Buzzfeed Japan website during May (2016) about a Mr. Watanabe, a Japanese father who regained custody of his daughter after a six-year court battle throughout most of which he and his daughter were prevented from knowing and seeing each other. 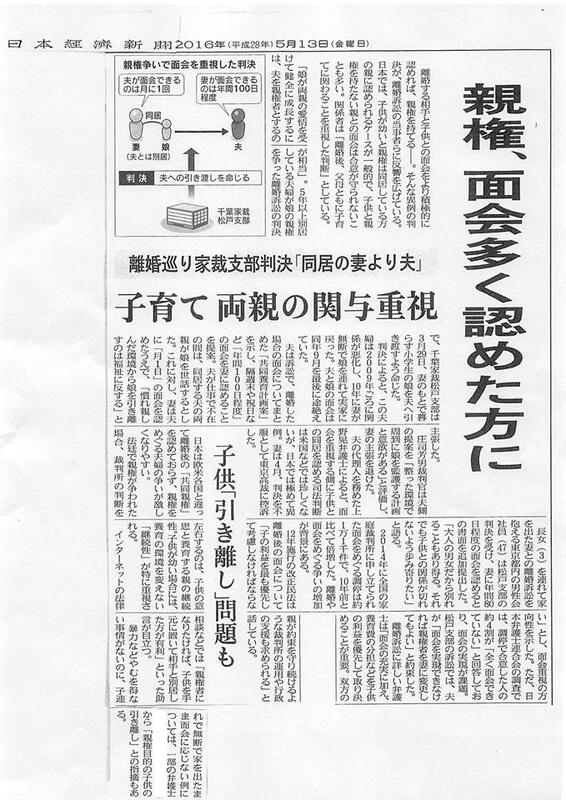 I am aware, as are all parents of Japan’s kidnapped children, of the importance of Mr Watanabe’s case. I’ve known of it for years. It was, I think, Mr. Watanabe who brought my case, and my blog posts about it to the attention of an American left behind parent; and from that moment, I came to know about many more parents and their difficulties, courtesy of Japan. I am grateful to him for this and more. Through speaking up and listening in this way, I gradually came to know the conditions under which Japanese family courts prevail against and permanently deny the rights of children to know their own parents. Through court and police actions, denial of parental relations is continually reinforced by the force of law in Japanese society. In time, I gradually learned of the incapacity of the Japanese people to impress upon a state over which they do not have control, that it is impinging on them in the worst, most pathological sort of way by destroying so many of their parent-child relationships. In 2010, just as with Mr Watanabe, my son’s mother abducted him. She flew him to Japan, and I have not seen him or had news of him since. This is because the Japanese and U.S. governments have agreed to allow child abductions to remain irrevocable, to go unpunished, and to remain impossible to defend against. Given the very gradually declining influence of the U.S. in world affairs, this is one of the most successfully achieved U.S. policy objectives with regard to Japan. The protection of child abductors from having to return the children they abduct. As a result, my son no longer knows me, his now tragic, middle-aged father. His life was ruptured, and mine shattered. There are three million children in Japan who have no ongoing relationship that is meaningful with one half of their divorced parents’ families. They do not know their own fathers… and this is condoned and encouraged by the Japanese law, with the unqualified support of the United States. The U.S. stations 50,000 heavily armed troops in 87 locations on ostensibly Japanese territory in order to ensure that Japanese power structures and decision-making processes never change. Attempts at reform, at negotiating the removal of these occupying forces from Japan, at reconstituting Japan as an authentic democracy with a state that is responsive to and protective of its people, have been frowned upon and successfully thwarted. I am writing this again because this tragic, life-destroying circumstance affects people worldwide who are guilty of no crime other than having loved and married a Japanese person who because of the material circumstances just touched on, felt entitled to take complete control of a child’s life, and damage it beyond repair. The only thing that will change this is if there is a tremendous outpouring of friction and protest from Japanese people that says loudly and clearly to the State that is in the wrong, that the children must have their family ties preserved, and that the children should not be the victims of the childish and selfish wants of an adult parent who does not know any better, or who has been well-taught to disavow the misery sewn by her actions. Mr. Watanabe’s case is important for him and his daughter. It includes a recommendation that mother have about a third of the days of each year to spend with her daughter, despite her having prevented her from knowing her father for six, long years of struggle. This young girl will now have the privilege, acknowledged as rightful of children in every other country in the world, of knowing both of her parents. And her mother will have a privilege many in Japan do not; that of learning what it means to love and to share the love of a child with another person that child loves, despite her having acted upon a beastly and selfish desire to exercise control and exclude her daughter’s family from her life. She will have – at the very least – the opportunity to learn appreciation for that of which she deprived her daughter. She will have an opportunity to gain an understanding of the interconnectedness, empathy, collaboration and cooperation that are at the root of thriving life. As a result, her daughter will have a far higher likelihood to find happiness and a full, unbroken identity. That is a privilege, it turns out. I beg whoever is out there to cover our stories, and urge anyone with access to the press to do so as well. I have attempted to discuss aspects of this now for 6 years. I love my son; and I want my relationship with him restored. He and I are victims of a severe, onerous crime. And it is up to the people of Japan, the United States, and all persons who love children, to alter these circumstances. *Please see additional information and comments below in the reply/ comment section. *Later news stories report that other Japanese judges and attorneys are urging that this be regarded as a “special case” that should therefore be inapplicable to any other child’s circumstance, largely, so they say, because of the privileged family background of the father. The comments tend toward the idea that his large house and garden are what was decisive in this case; not the psychological needs and interests of a young and growing child. The malign, power-derived, even primitivist tendencies that are active in this kind of thinking are highly relevant, in my view. The courts in Japan have yet to arrive in the era of developmental psychology, of such commonplace conceptions of children’s psychological and emotional needs as those embodied in well-known doctrine and court standards, such as “the Best Interests of the Child” and “the Least Detrimental Alternative.” It appears that reducing the harm done to children is not something a Japanese family court judge feels compelled to understand, study, much less consider. Or if he does, then it is likely that he will have a deep lack of knowledge, and will therefore misconstrue the meaning of these concepts and apply narrow, disciplinary, moralistic reasoning. Thus, the power to impose a decision that is clearly detrimental finds no answering or balancing force; and the Japanese family court retains its right to wreak havoc on children and parents. The case, it turns out, is not settled yet. There is an appeal to a Higher Court. Apparently, it’s not considered a just outcome by the mother in this case for their child to have two parents because she wants to retain the right to severely restrict or eliminate communication and a fruitful parent-child relationship.